I came up with one accent nail and used some sponging technique on the others to bring everything together. Before I go on, I'd like to thank my friend, Pads. We were exchanging text messages the other night and the conversation fell into movies that we were both anticipating to see. 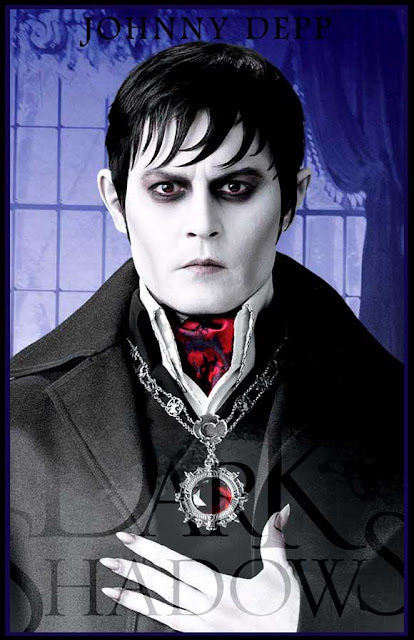 He reminded me that Dark Shadows will be shown this week. 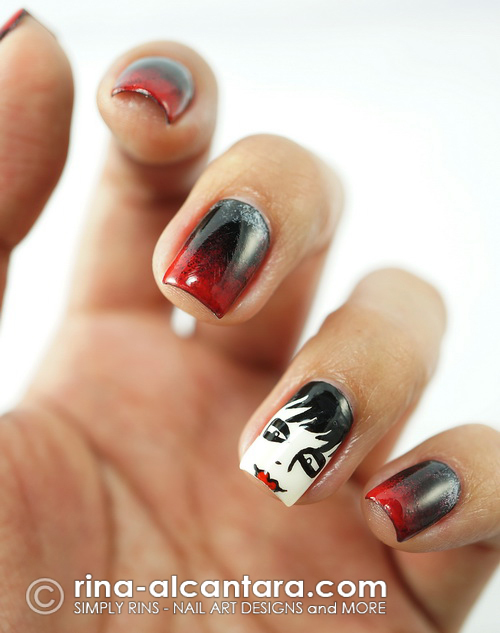 This actually made me start brainstorming on possible nail art ideas. In the end, I challenged myself to draw the character of Johnny Depp and I was keeping my fingers crossed that I could pull it off. I used 3 thin coats of Color Club Paris White as base color for the accent nail. Application can be tricky because of visible streaks. Most of my white polishes are. I am still in the lookout for a good white polish with fabulous formula. That's Deborah Lippmann Edge of Glory on all my other nails in 2 coats. I felt guilty using it without it's partner polish (read about it here). But I realized I've used up 2 of the black polishes in my stash. I need to get one. Black is one of the colors I really like on my nails. For the red tint I used on my nail tips, I used OPI Tazmanian Devil Made Me Do It. 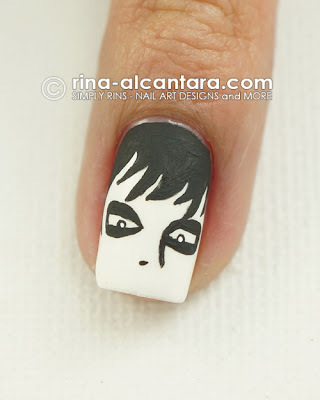 I used acrylic paints and a detailing nail art brush to freehand a cartoon version of Barnabas Collins on the accent nail. Step 01: Paint your accent nail white and let it completely dry before painting your design. I first painted the hair. Make sure you have enough space for the face when you do this. Step 02: Draw the eyes. Make the eyebrows and eyeliner prominent. Add a small white dot for further detail. add a tiny line at the bottom. I exaggerated this a little for this cartoon version. some of the black paint visible to serve as outline. Step 06: Don't forget to seal your design with your favorite top coat. 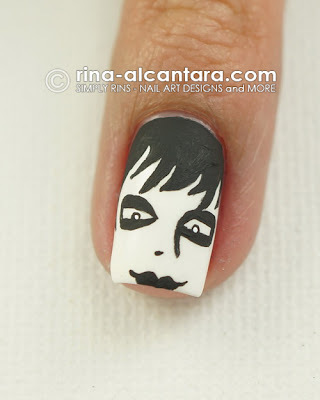 Initially, I wanted to just paint my other nails with black polish. 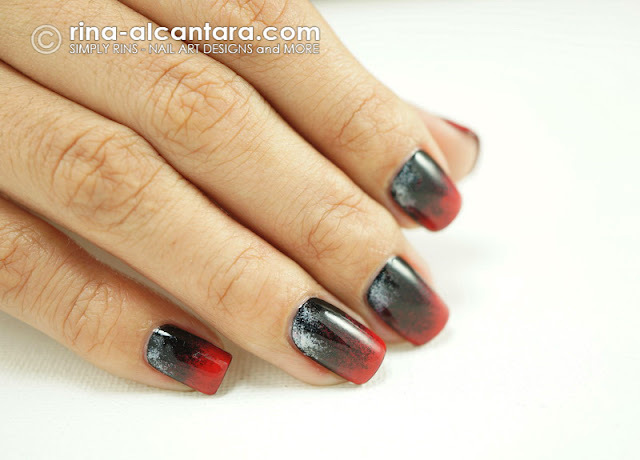 But to make the design more interesting, I decided to tie my other nails to the accent nails by creating gradient look using black, white, and red polishes. If you don't want an accent nail, I think this gradient look is enough to wear as a Dark Shadows inspired nail design. I first painted all my other nails with the black polish. I then sponged a bright red on my nail tips and a sponged a little white on top. I loved the fact that I was reunited with 2 of my favorite colors, red and black. I really like them on my nails. 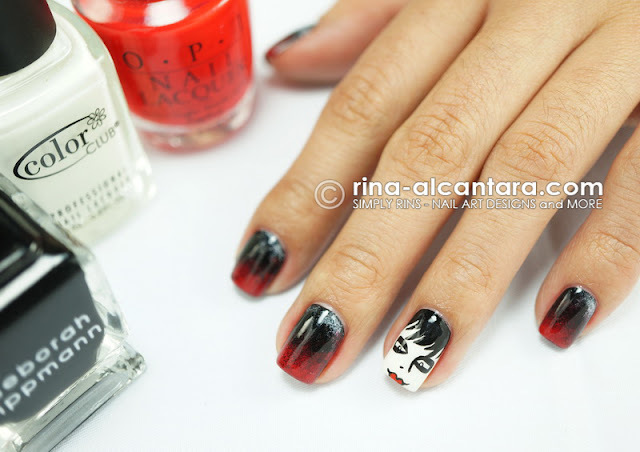 Hence, the many pictures I took of this Dark Shadows inspired nail art. Which reminds me that when I did the Pirates of the Caribbean design, I also used black and red! I wonder how this would look when matted. I'll try after watching the movie. If you noticed, I didn't create an accent nail on my right hand. Initially, I wanted to paint a cartoon version of the witch. But I felt I would have a hard time working with my non-dominant hand for that so I just opted to give the entire spotlight to Johnny Depp. I know, excuses! 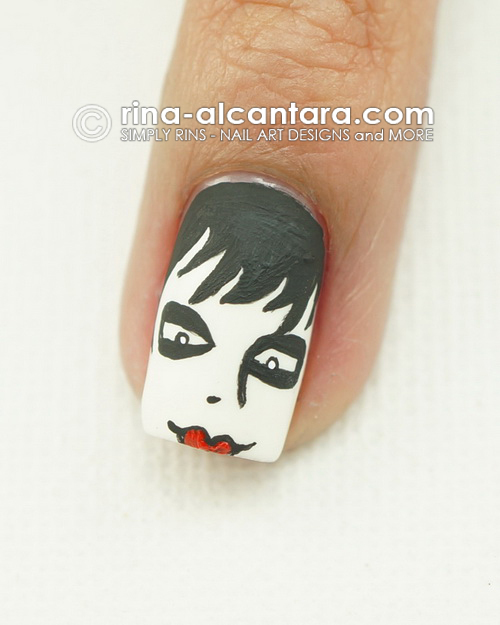 This nail art will remain on my nails until I watch the movie. Tonight, perhaps? I actually have another nail design to post but I decided to post this first. I liked how it turned out. What do you think? 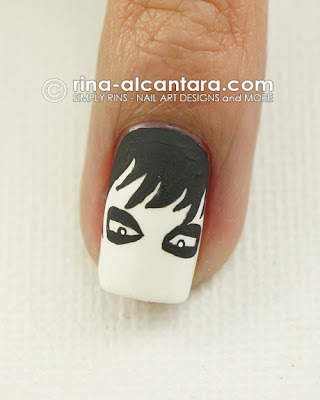 Did I pull off a cartoon version of Barnabas Collins? Do you think the gradient look tied the other nails together? He looks fantastic and I LOVE your gradient, those colors are gorgeous together. 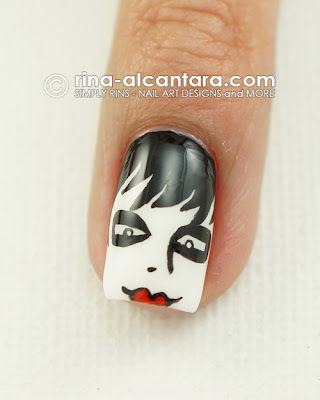 I love this nail art and johnny depp is my most fav actor !!! By far. Ever seen cry baby? This is amazing! Can't wait to see the movie too! Love this! I liked your other Johnny Depp tutorials too, I had a go myself when I went to see POTC. 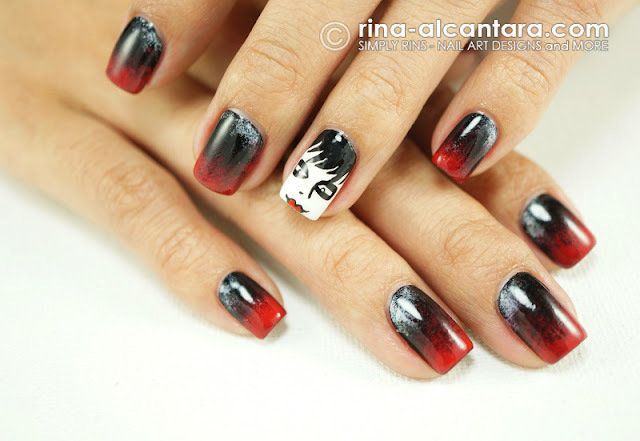 I think this will be my mani when I go see Dark Shadows too. Do you mind if I copy this? If I can?! Why not? :) And thanks for letting your friends know about my site. Ohhhhh my Godddd that's awesome, I lookin for any example for my nayl art and I foun your blog, I really love it.... al my compliments! this is really impressive! I love it!